Its sure has been cold in March - but now we are starting to see a few warmer days. George and I travelled to Mountain Laurel Pomona’s meeting in March at Riverton Grange. It was great to spend some time with Lecturer Lin Erickson and my new friend Morgan from Canton High School. I also got to check out the beautiful baskets donated by Cawasa Grange for the drawing at Leader’s Conference. On February 26 at Winchester Grange, five new members took their obligation - three from Riverton and two from Winchester. I got to have my photo taken with Phil & Maureen Prelli and Peter Keefe. Welcome to the new members! 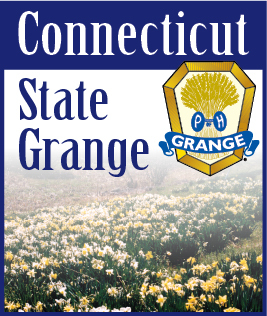 I also have recently participated in the 8-Day Grange Photo Challenge on Facebook, where you have to post a Grange photo a day for 8 days, and then tag a friend to do the same. It was fun looking at older photos and taking a walk down memory lane.